This newspaper story was published in the February 25, 1889 edition of the Wheeling Intelligencer. The story originally came from the Raleigh County Index, a short-lived weekly newspaper out of Beckley, WV. It was only published between 1880 and 1893. I found this copy on my current favorite website, Chronicling America! 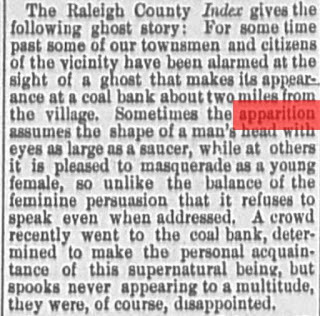 Transcript: The Raleigh County Index gives the following ghost story: For some time past some of our townsmen and citizens of the vicinity have been alarmed at the sight of a ghost that makes its appearance at a coal bank about two miles from the village. Sometimes the apparition assumes the shape of a man's head with eyes as large as a saucer, while at others it is pleased to masquerade as a young female, so unlike the balance of the feminine persuasion that it refuses to speak even when addressed. A crowd recently went to the coal bank, determined to make the personal acquaintance of this supernatural being, but spooks never appearing to a multitude, they were, of course, disappointed.